English (Traducir este texto en Español): The lake is marine, 30 m deep, and characterized by both oxic and anoxic water layers separated by a distinct chemo-and thermocline. Above 15 m, the lake is well lighted, oxic, and with normal marine salinity and temperatures. Below that, the lake is dark and anoxic with high sulfide content in the water and sediment. 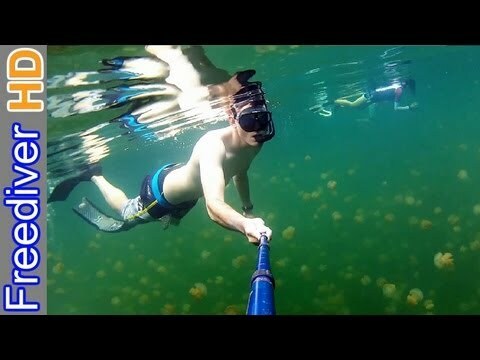 The locals tell visitors before they jump in the water: "when you see 1000 jellyfish, keep going, when you see 10,000 jellyfish, keep going, when you see 100,000 jellyfish, keep going, when you see 1,000,000 jellyfish, stop, you’re there." This is a unique snorkeling experience! The lake is marine, 30 m deep, and characterized by both oxic and anoxic water layers separated by a distinct chemo-and thermocline. Above 15 m, the lake is well lighted, oxic, and with normal marine salinity and temperatures. Below that, the lake is dark and anoxic with high sulfide content in the water and sediment. Jellyfish Lake NOT a dive site - Dear fellow divers, at Jellyfish Lake, you may only snorkel. Diving is strictly prohibited for 2 reasons: 1. not to tamper with the fragile jellyfish 2. the bottom of the lake is toxic. The snorkelling there is an unforgettable experience and highly recommended!